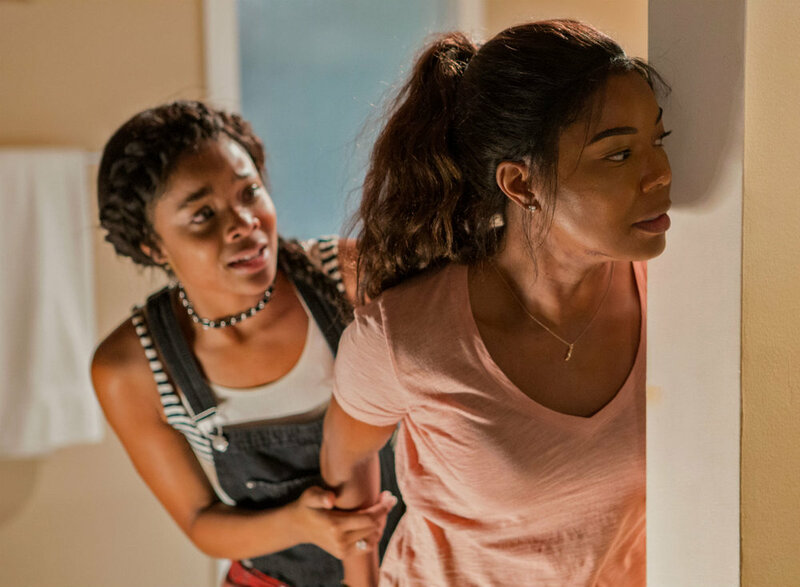 The discount home invasion thriller Breaking In stars Gabrielle Union as Shaun, a mother compelled to get back into a fortress-like mansion to save her son and daughter from four homicide-happy burglars, who have 90 minutes to find, break into, and unload a safe before the police arrive. You can forget the ticking clock premise, though — the movie certainly does — because the only tension in the film is the resilience of the bad guys, in what is essentially a high-stakes game of Whac-A-Mole. What happened to that guy backed over with the truck? Damn, he’s back in the bedroom! We first meet Shaun as a chiding but loving mom, when she takes a road trip with her two children — grade-schooler Glover (Seth Carr) and teen princess Jasmine (Aijona Alexus) — to the Wisconsin mansion where Shaun was raised by her estranged father. Dad, who we see briefly in an introductory scene, was a wealthy financial criminal who was run over by a car just before his sentencing. Shortly after Shaun and the kids arrive at the massive country pile and check out the disengaged high-tech security system, they get attacked by bad guys hiding in the house. The two children are quickly grabbed and locked in a room and Mom’s shut out of the house. In fact, Captain Obvious’s greatest weakness is also in the house — his incompetent crew, who make the guys in Home Alone look like David Niven and Cary Grant. They include the put-upon, Boy-Band Guy (Levi Meaden, who occasionally gazes into a two-way mirror to admire his blonde spike hair-do) and Psycho Latino (Richard Cabral) who has a lemur’s pop-eyed stare and can’t stop touching the big knife on his belt. The set-up promises a reverse Panic Room (in which Jodie Foster protected a young Kristen Stewart from violent thugs, allowing her to grow up and marry a vampire in Twilight) but nobody has expended the intelligence to make it work. Australian director James McTeigue is competent enough with the fight scenes but is content to coast along on the script which led to more giggles of incredulity at the preview screening. Shaun seems able to pop in and out of the house as she wants to and can grapple like a marine. Other family-saving action stars — Bruce Willis’s John McClane, Liam Neeson’s Bryan Mills — have explanations for their special skills. Could someone please give this woman a credible backstory? The likeable Union, who is convincing enough trash-talking or menacingly staring down the kidnappers, is also a producer of the film. The actress has been vocal about the shortage of good parts for African-American women, and you can understand why she got behind this. Her role as a strong black woman breaking into the home to which she is entitled has an empowering subtext (it’s the opposite of Get Out). It’s just too bad she didn’t wait to break into something a little classier. Breaking In. Directed by James McTeigue. Written by Ryan Engle. Starring Gabrielle Union, Billy Burke, Ajiona Alexus, Seth Carr, Richard Cabral, Levi Meaden, and Mark Furze. Opens wide May 11.